That alarming stat could be scary to a potential entrepreneur, but understanding the full scope of starting a new business is critical to its long-term success. The risks, though great, can be mitigated through extensive market research. The National Venture Capital Association estimates that 25%-35% of venture-backed business fail. On average, one-year-old firms create nearly 1 million jobs. 80% of second-time business owners succeed. 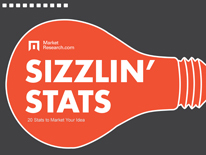 To get the full set of great stats and more, fill out the form to this SlideShare.